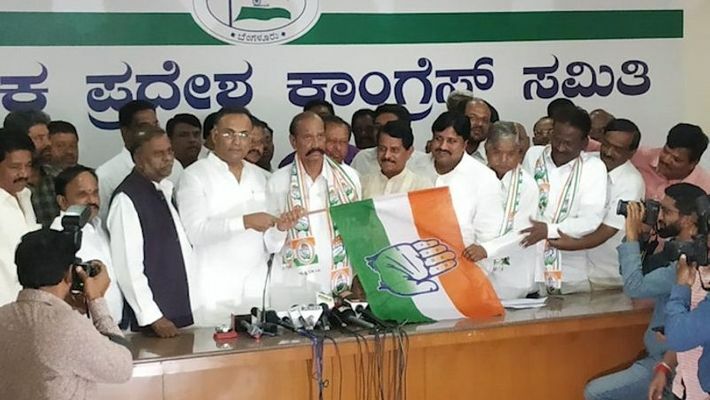 Molakalmuru leader S Thippeswamy, who joined the Congress with the help of KPCC President Dinesh Gundu Rao, says he has done so without setting any conditions. He also stated that he will help the Congress beat the BJP in Chitradurga, but the BJP feels that Thipppeswamy will learn his lesson. Bengaluru: Former BJP leader S Thippeswamy from Molakalmuru who defected and joined the Congress a few days ago, said, he was used and side-lined by the Reddy brothers and the BJP. Thippeswamy seemed confident of beating the BJP in Chitradurga, but BJP was equally confident that their former party member would learn his lesson in the election. Thippeswamy was originally a Congressman and joined the Reddy brothers. Even when Sriramulu broke away with the BJP and formed the BSR party, Thippeswamy contested and won from Molakalmuru. However, things turned ugly after Sriramulu decided to contest from Molakalmuru in 2019. Humiliated by this development, Thippeswamy turned rebel and contested as an independent and lost, and now he has joined the Congress. Speaking to MyNation, Thippeswamy said, “the BJP and Reddy brothers have cheated ST communities here, there is no development and only divide and rule policy exists. My sacrifices and contribution were ignored. They (BJP) cannot do justice to SC and ST community segments in Chitradurga, Ballari and Raichur. Now that Congress has already made inroads into Ballari in the by-election, together we will ensure the party wins all these MP seats," said Thippeswamy. Realising that SC and ST leaders will boost the chances of Congress in Chitradurga, Raichur and Ballari where BJP can upset congress candidate’s prospectus, party high command, sitting MP from Chitradurga, Chandrappa and KPCC President Dinesh Gundu Rao managed to convince Thippeswamy to defect by allegedly offering him a post. When asked about his interest in contesting as a MP from either of these segments, Thippeswamy said he joined the Congress without any conditions and will work to strengthen the SC and ST segments. However, the BJP remains confident of winning all the three segments under Prime Minister Modi’s leadership. Chitradurga District President KS Naveen agreed that Thippeswamy has strength in few areas of Molakalmuru Assembly segments but stated that his strength is limited, and his movement will not have any impact. "We have our aspirants former minister Anekal Narayanaswamy, former MP Janardhana Swamy and others who can cause the Congress to worry. Thippeswamy's migration to the Congress will not impact the BJP in any way," said Naveen. At present, in all the three MP segments, the Congress is in power. In 2014 BV Nayak from Congress won the Raichur seat with 4,43,659 votes while his rival K Shivangouda Nayak came second with 4,42,160 votes. Similarly, in Chitradurga, B N Chandrappa defeated BJP's sitting MP Janardhana Swamy by securing 4,67,372 votes. The biggest win for the Congress in Karnataka in terms of the MP election in recent years from Ballari after the Reddy brothers turned the Congress bastion into their fort in 2004, was in the 2018 by-election. VS Ugrappa secured 6,28,365 and pushed J Shantha, sister of Sriramulu to the second spot.